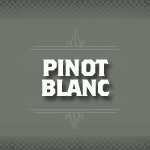 Pinot Blanc is a white wine grape variety. It is a point genetic mutation of Pinot Noir, which is genetically unstable, and will on occasion produce a vine of all black grapes except one cane, which will be white.The wine produced from this grape is full bodied and can be either dry or sweet. Green fruit, apple, citrus and floral notes can be encountered.